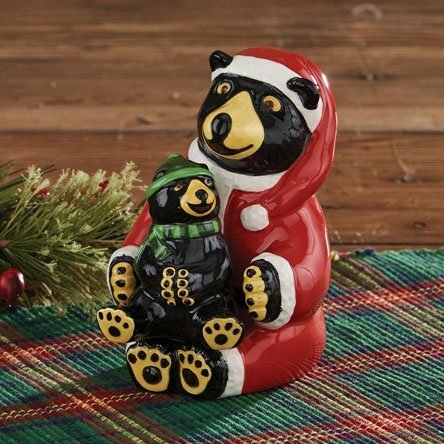 In the Hometown Holiday Collection, this salt & pepper set features a black bear dressed in a red Santa suit and the cub wearing a green toboggan and scarf. Sweet expressions on the bears' faces make this a charming holiday set to have. The baby bear pepper shaker can sit in the Santa bear's lap, or they can sit side by side. Dimensions: Santa Bear Salt 5"h x 2.75"w and Baby Bear Pepper 2.5"h x 2"w. Made of high fire dolomite by Park Designs. Two piece set.